A distinctive range of communications, that each has their own voice while also supporting the core King’s brand. 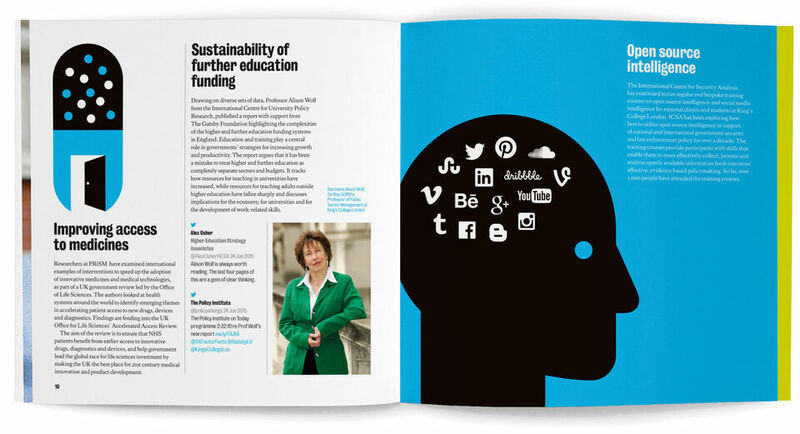 We work with a number of departments at King’s College London, creating a varied suite of communications that incorporate campaigns, identity, print and digital. Our aim is always to create a distinctive personality for each project, while also reflecting and reinforcing the primary King’s brand, with regard to typography, colour and tone of voice. 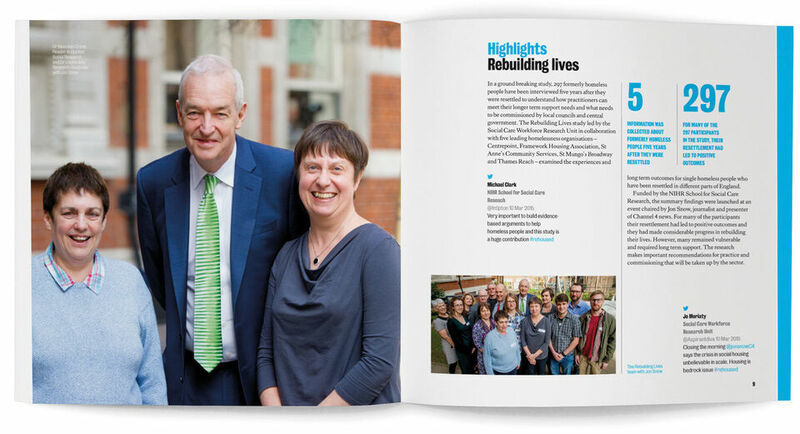 This was the first impact report of the Policy Institute; a review detailing the key areas of the Institute’s work and achievements over the year. 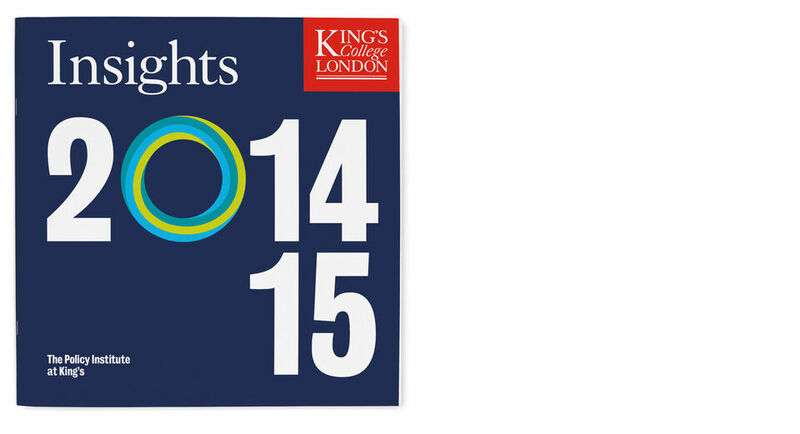 It was launched at an Annual Reception in September 2015 at the Institute. 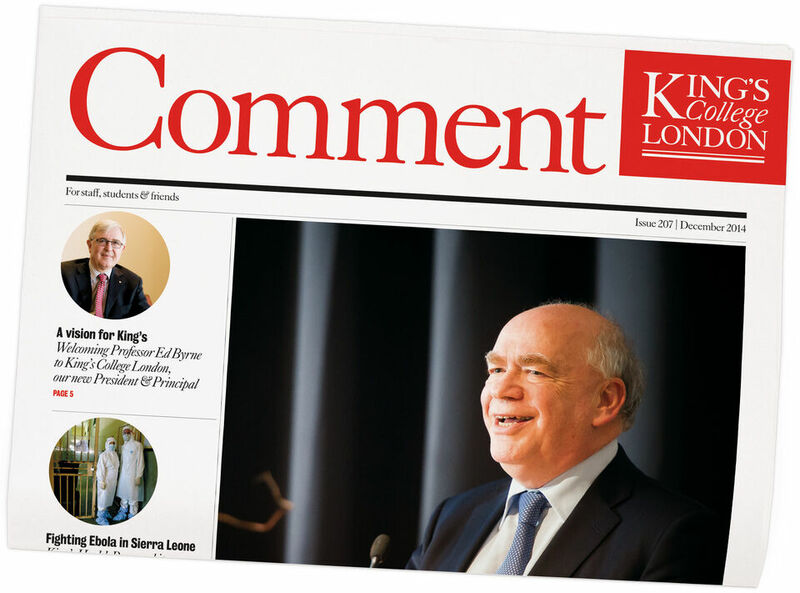 The report had to speak to a wide readership; internal King’s colleagues who would like to know more about the Institute’s work and impact, and key external stakeholders from policy, government, business and academic communities. 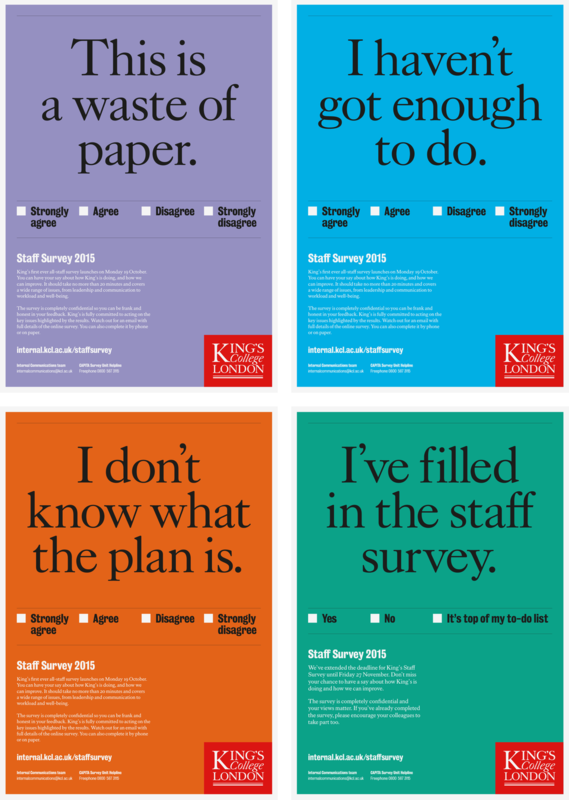 The Staff Survey campaign ran as posters and screens around the King’s campuses. To make the posters recognisable as a series we used a standard layout incorporating bright, bold colours from the core palette and humorous headlines appropriating the style of a questionnaire. Policy Idol is an annual competition open to all current students and staff at King’s, in which participants pitch their policy ideas to an elite panel of leading figures from the worlds of politics, academia and industry. Double-take illustration and dynamic typography form the basis of the identity. Research evidence suggests that students with lower prior attainment (often students from disadvantaged backgrounds) do better if taught in mixed attainment (mixed ability) settings. However, less is known about why this is, or what characterises successful practice in mixed attainment classes. 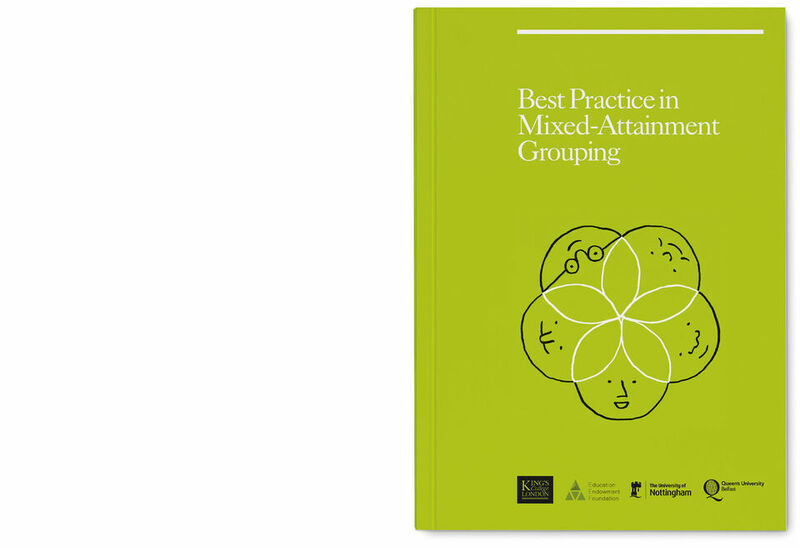 The Best Practice in Mixed Attainment Grouping intervention seeks to address these questions by applying and testing principles of good practice. 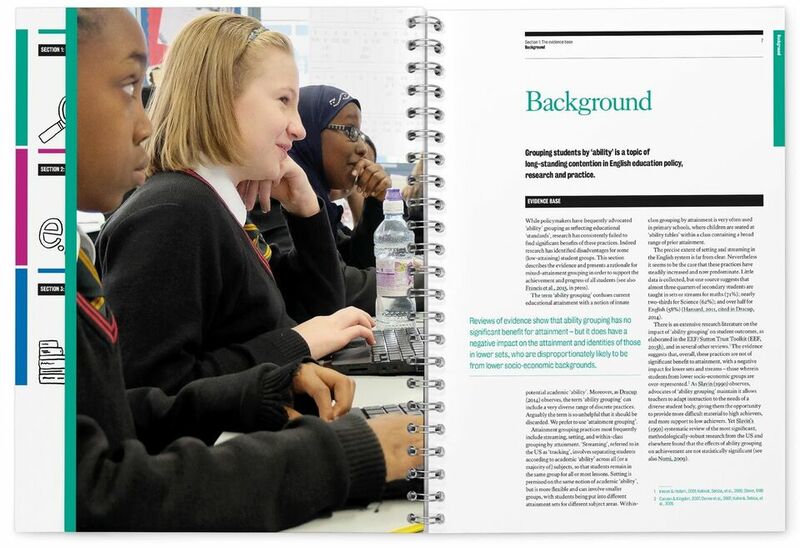 The target audience of the report was secondary school English and maths teachers, teaching Years 7 and 8. The aim was to educate teachers on how to change their teaching practices and have a clear understanding of how and why they should do this, in order to facilitate the raising of attainment by children from disadvantaged backgrounds. 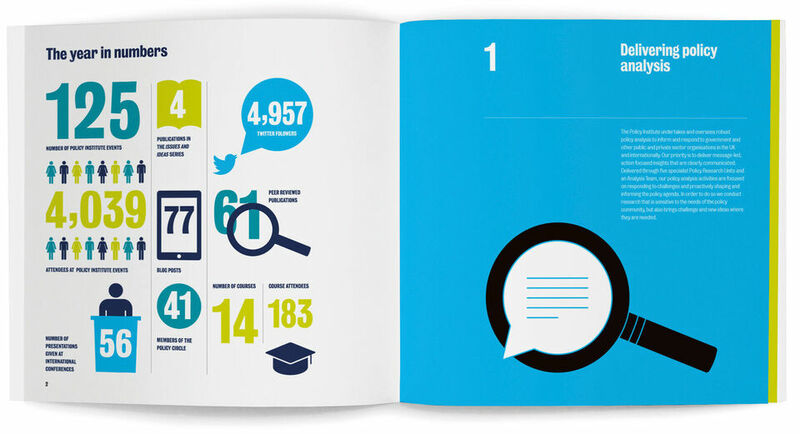 To this end, it was important to make the report as clear and easy to follow as possible. 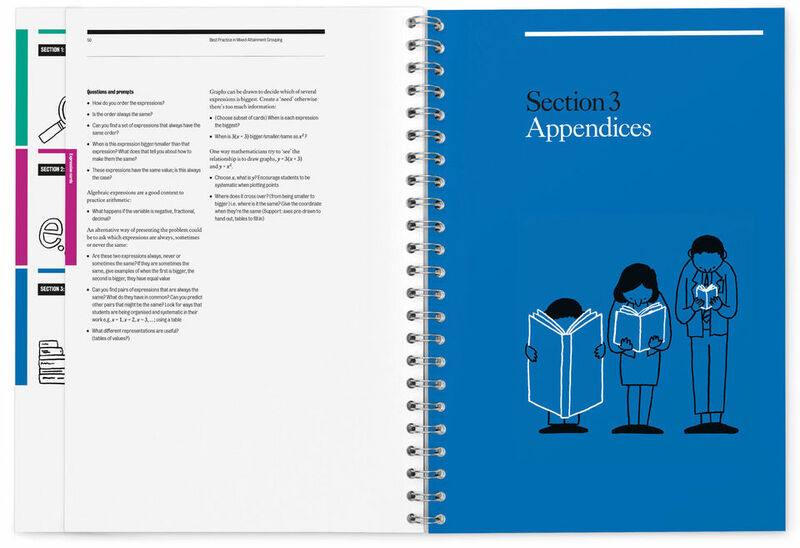 Information was broken down into colour-coded sections and tabbed edges were used throughout to allow teachers to easily navigate the document. 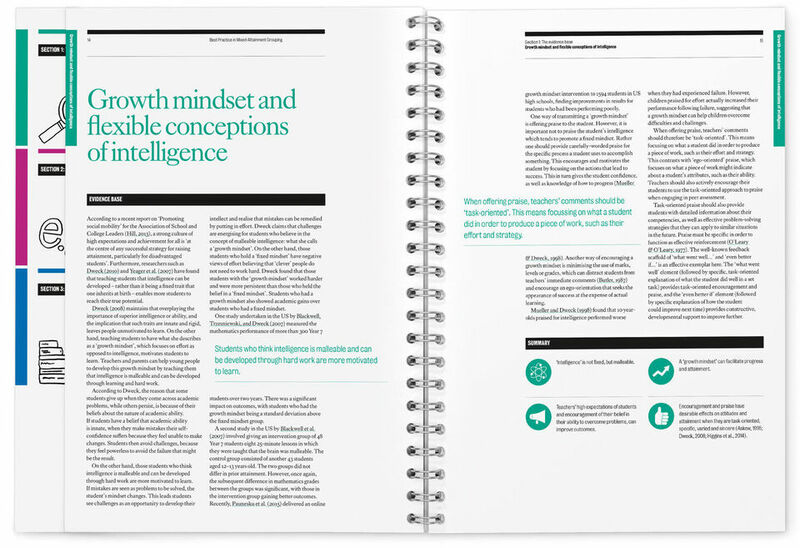 Articles were summarised in icon form to distil the key points. 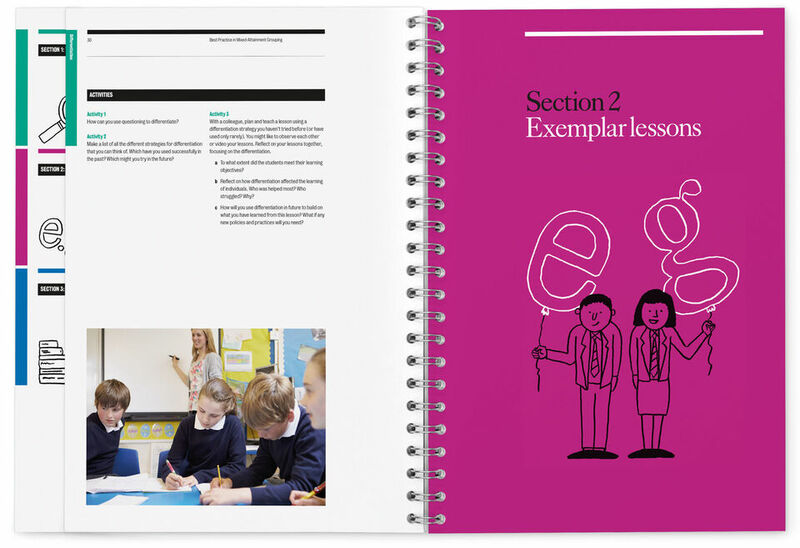 Spiral binding and bold, contrasting colours were deliberately chosen to allow for easy photocopy reproduction by teachers. Finally, hand-drawn illustrations added a touch of humour and lightened the feel of what was otherwise a text-heavy document. Money Mentors give fellow students guidance regarding financial matters. 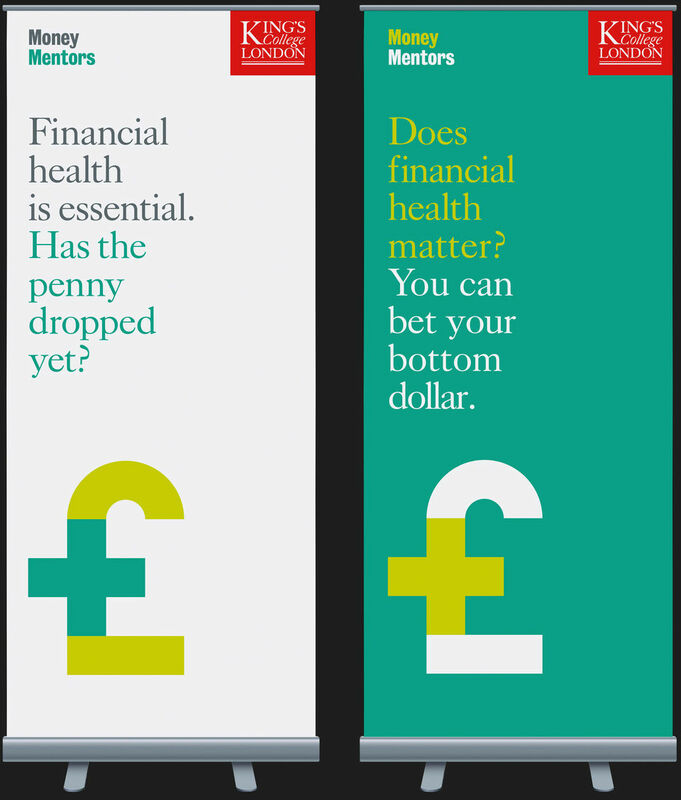 We gave the scheme a simple identity using a smart icon referencing ‘financial health’, copy that played on currency-based idioms, and a selection of appropriate colours from the King’s palette. 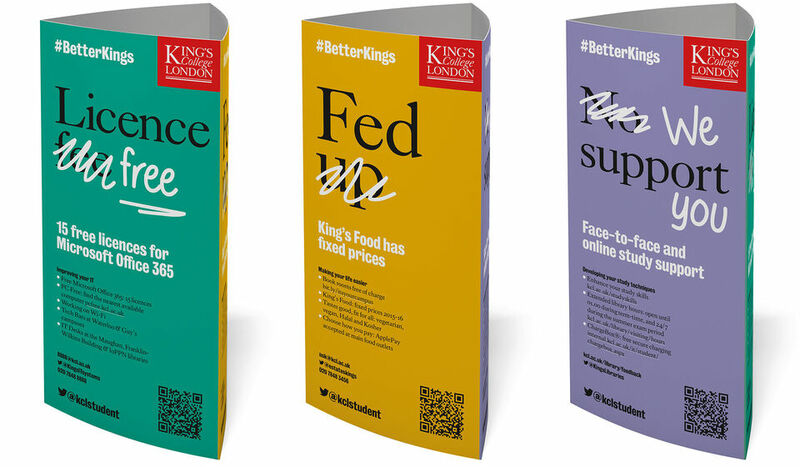 The #BetterKings campaign was created to promote some of the things King’s have been doing to improve the student experience. Our campaign identity was a simple typographic intervention, which could be easily adapted to a variety of applications.